Have an exotic Valentines Day with your loved ones by gifting them this Attractive Teddy Bears and Delicious Chocolates Combo to cast a magical spell upon them. 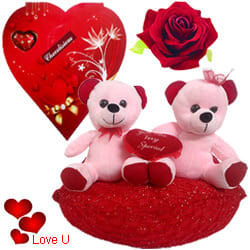 You can convey the Three Magical Words to your partner without saying a word by sending this spectacular 11 Pcs of handmade Chocolates and a couple of Teddy Bears in Pink and Red color sitting on a Red Heart shaped Cushion that adds extra love for your partner, The size of these Teddys are 18 cm. Flowers Delivery Goa, Send sweets Tanjavur, Wedding Cake Hosiarpur, Diwali Mithai Garia, Send Flowers and Gifts to Jhansi, Online Shop Chittoor, Flower to Bhatinda, New Year Flowers Dehradun , Fresh Fruits Rishikesh, Send Gift Tirumala, Dry Fruits to Devangere, Birthday Delivery Trivandrum, Sending to Taran Taran, Flower shop Hissar, Gaziabad Online Cake Delivery.